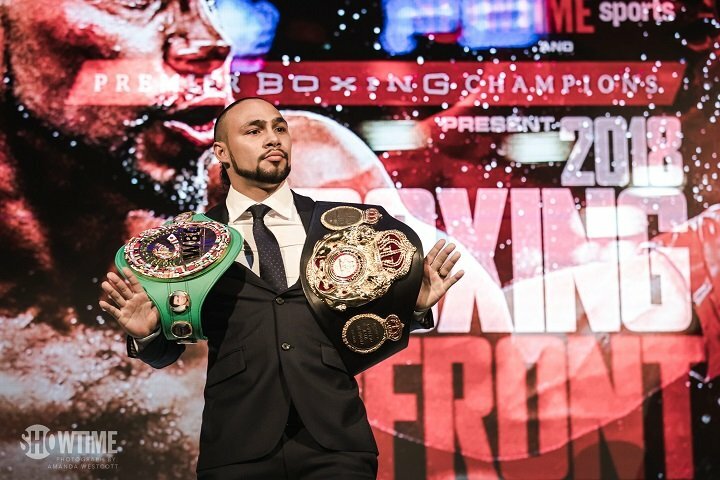 By Jeff Aranow: WBA World welterweight champion Keith Thurman is expected to be coming from his injury problems to fight on August 4 against an opponent still to be determined at the Barclays Center in Brooklyn, New York. Thurman, 29, will have been out of the ring for 17 months by the time he fights on August 4. ESPN are reporting that the injury prone Thurman will be emerging – possibly – on August 4 to fight. Of course, that’s a long way from now. Training camp will be a virtual minefield for Thurman in trying to maneuver through it without suffering some ache or pain that causes him to cancel the fight. Thurman last fought on March 4 in beating former WBC welterweight champion Danny Garcia by a 12 round split decision in a unification fight. Thurman was injured in that fight, and then he later suffered a second injury while training. Thurman had to give up his WBC title, and he’s obviously hoping he doesn’t have to give up his WBA belt as well. Thurman had calcium deposits and bone spurts that needed to be removed through surgery after his close win over Danny Garcia last March. Thurman returned to training, but he then suffered a deep bone bruise in his last hand that made it necessary for him to pull out of his May 19 fight. There’s rumors that Thurman could be facing 33-year-old former world title challenger Josesito Lopez (36-7, 19 KOs) on August 4. Lopez is now a journeyman, having lost a lot of fights ion a brief period of time from 2011 to 2013. The good news is Lopez isn’t losing nearly at the same rapid rate that he was during those years. The sad news is Lopez’s opposition has been horrible lately, which might explain why he stopped losing. Lopez’s last loss came to Andre Berto by a 6th round knockout in March 2015. The win for Berto led to him getting a big payday fight against Floyd Mayweather Jr. in September 2015. The WBA will likely move Lopez up to a spot in the top 15 before Thurman faces him, if he faces him. If Thurman wins his next fight, he’ll likely need to fight Jessie Vargas next. He’s ranked highly at No.2 with the World Boxing Association. Thurman no longer must worry about Shawn Porter and Danny Garcia, as those two are fighting for his vacant WBC welterweight title. IBF welterweight champion Errol Spence Jr. wishes to fight Thurman, but that’s not going to happen in 2018. Thurman says 2018 is his “get back year,” which means he wants to devote the year in taking tune-up fights. Thurman needs to start fighting a little more frequently for him to continue to be the best. For a fleeting period of time, Thurman was viewed as the best welterweight in the world after Mayweather retired. Now with injuries, Thurman is viewed a fragile fighter, who doesn’t have his mind on boxing any longer.